Ovation AX Series Guitars offer the exact same specs and features of their LX siblings at a price that makes them exceptional values. The Ovation Custom Legend C2079 AX Deep Contour Acoustic-Electric Guitar features a hand-selected, premium AAA solid-spruce top with LX scalloped bracing. The guitar's Deep Contour Bowl composite body maximizes acoustic output and is ergonomically designed for comfort in any playing position. A cutaway offers full access to the gloss-finished, 5-piece mahogany/maple neck. The guitar boasts an ebony fretboard and bridge, and hand-set abalone body and fretboard inlays. The traditional center soundhole has a gorgeous laser-cut oak-leaf and abalone rosette. With its onboard compressor, the OP-Pro Studio preamp enhances strummed chords, fingerpicked arpeggios, and single-note solos. Dual XLR and ¼" output jacks connect the Custom Legend Contour to virtually any sound system, stage amp, or recording console. Ovation's Deep Bowl body generates maximum unamplified volume and enormous low end, yet it's easier to hold and play then a traditional jumbo-body guitar. Models sporting Deep Bowl bodies also perform impressively when plugged in, thanks to Ovation's advanced onboard electronics. A "sonic cannon" that shines either unplugged or through a sound system or stage amp, a Deep Bowl Ovation offers the best of both electric and acoustic worlds. A lightweight dual-action truss rod makes precision adjustments simple. Carbon fiber stabilizers keep the fingerboard perfectly aligned at the neck/body joint. The OP-Pro Studio combines state-of-the-art audio quality with exclusive features designed to meet the needs of professional guitarists. The easy-to-operate unit offers 3-band EQ, exciter and compressor/limiter circuitry, and a chromatic tuner. Ovation's exclusive Expressor and Drive sliders put dynamic control and harmonic enhancement at your fingertips, allowing you to dial in the precise amount of sustain and punch required by the music. The Op-Pro Preamp is voiced to give you arena-sized sound with a minimum of eq gymnastics. Every improvement comes directly from the needs of pro players and sound. Six separate elements sense both string and top vibration, giving you a better string-to-string balance, no matter what string type or guage you use. The exotic wood leaf-shaped "epaulets" are now inlaid into the top with laser precision. The new cleaner design actually offers a slight sound enhancement. Play an LX and prepare to be impressed by the hugeness of the acoustic sound. Deeper, richer but with the legendary Ovation balance and clarity. The smooth, hard composite Lyrachord GS body improves projection and reflects top vibrations better than traditional material and is now even lighter and stronger. Includes case. Get more Ovation for your buck. Order today. I was a little apprehensive about buying an acoustic guitar online and having it shipped to me. I'd have preferred to buy locally, where I could try it out and take it home with me. Unfortunately, none of my local dealers had one in stock. They could order one for me, but then again, I could order one for myself and get a much better price. Even with the guitar in stock and a better price, I almost didn't buy from Custom Guitar's Friend. There was no mention in their listing whether the guitar came with a case, even though it sells for more than a grand and the Ovation website says they ship it with one. I sent a request for additional information, and the person who responded to the request told me it didn't appear that it did, but I could call him if I wanted him to check on it. Really?!!? Fortunately, the person who answered my follow-up question was a little more customer service oriented and made the effort to find out that the guitar does indeed come with a case. HINT: If the guitar comes with a case, say so in the description. Knowing that it came with a case made me a little less nervous about ordering it, so I placed the order around 9:30 on a Friday night. I was really surprised to find it waiting at my post office by 10:00 the following Monday. It arrived in perfect condition, putting my fears to rest once and for all. The pictures on the websites didn't do justice to the Cherry Cherryburst finish, which is a translucent stain that lets the wood grain show through. Everything about the fit and finish of this guitar suggests a much more expensive guitar, from the tuners to the binding on the body to the bound ebony fretboard and bridge to the abalone inlays. It may have been made in Korea, but the workmanship is second to none. It was set up and ready to play straight out of the case. It was tuned down a half-step, and after letting it warm up to room temperature, I tuned it to pitch using the built in chromatic tuner. It tuned quickly and easily and stayed in tune while I tried it out. The unamplified sound was full and projected nicely, reminiscent of a deep bodied Ovation I had back in the '70s. I have a super-shallow bodied Ovation that sounds great amplified but leaves a little to be desired when played without an amplifier, so I wasn't sure how the new deep contour body would deliver. Let me just say that this Custom Legend C2079AX can hold its own with the big-bodied jumbo guitars playing unamplified, and it fits on my lap without digging into my ribs or slipping off when I'm sitting down. Where it really shines, though, is plugged in. The Op-Pro Studio with XLR preamp includes both a standard 1/4" jack for using a regular guitar cable and an XLR jack for plugging directly into high end acoustic amps, PA systems, and mixing boards. When plugged in with an XLR cable, it supplies phantom power to the preamp which should conserve battery power, but since it doesn't come with an XLR cable, I haven't seen how this works. Like almost all Ovations, there are three slider controls for adjusting the Low, Mid, and High EQ range up or down, with a Gain knob for adjusting the overall output. The Op-Pro adds an "Expressor" slider which acts as a compressor in conjunction with the Drive knob setting to blend in harmonic content with the piezo signal for an even broader range of tones. I've experimented with those a little, and I'm sure I'll want to use them someday when I know how to adjust them to get the just right sound, but for now, I've got the expressor set midway with the drive turned all the way down. For my style of playing—mostly folk fingerpicking and blues—I want the nuances to come through, and this combination works well through my Kustom acoustic guitar amplifier to deliver clean, pure guitar sound. I'd have spent a lot more money to get an Ovation made in America or a high end all-wood guitar (like Martin, Gibson, Taylor, Guild), but I don't think I could be any happier than I am with my Custom Legend C2079AX. In fact, if I held out for one of the others, I wouldn't have one yet because I'd still be saving up to buy it. This is a great guitar, and a great guitar you can make music with will get you further than any high end guitar hanging on a dealer's wall because you can't afford it. Get the Ovation; play it; and when you sell your next record, then decide whether you really need something better. My guess is the Ovation will be around for a while. Did I mention it comes with a case? .I have been blessed to own and play many acoustic guitars. Being a studio musician as well as an active performance guitarist has meant that I am mandated to wear several different hats in terms of what I play. This guitar has suprised me in ways I never thought possible. It has become my main acoustic guitar when playing live because of it's electronic features (onboard tuner, pickup system). It has also presented itself as a very viable option when recording. I can mic the guitar like any other acoustic and run a direct line-in from the guitar itself. The guitar does not over-power my vocals when recording with one mic...leaving me very pleased with the results. I was cautious with an Ovation because of its non-traditional materials. I can honestly tell you not to worry; and that my other guitars are now jealous. .First, I'm not completely new to Ovations, but this is by far the best one I've played or owned. Had one years ago (70's) liked the sound, but really didn't bond with the big round back. I picked up a cheaper Celebrity Deluxe CS257 a few years ago, super shallow back for one purpose, to play plugged in at gigs. I can say it did ok, nothing great but ok. Was really looking for something that has a great plugged in sound and easy to play. I thought I found the guitar I was looking for after reading many reviews on it (Yamaha AC3R). It seemed to have the most advanced electronics with the best sound in a guitar that didn't cost over $3k. I just couldn't see having that expensive of a guitar in a bar/gig setting. I ordered the Yamaha expecting the plugged in sound to be fantastic. Nope, my old cheap Ovation sounded better with more output to boot. So, I look and looked and went with the Ovation 2079AX... I am NOT disappointed - the looks, the feel of the contoured back was fantastic, the acoustic sound was way better than the Yamaha, the electric sound was way, way, way better than the Yamaha.
. The quality of the sound is excellent through my PA system. I am an average guitar player, my main instrument is bass guitar. I have a few problems with making quality sounds out of the Ovation, as I play bar chords on the upper part of the neck, but that could be caused with the fact that I am not an accomplished guitar player. The tuner is fantastic to have on the guitar, otherwise, I would use an external tuner. It also has some capability of controlling the lows, mids, and highs on the guitar itself. I just recently purchased a "used" C2079 from Custom Guitar's Friends. I was amazed that the guitar appeared to be in perfect condition with no scratches, etc, although I believe that they said there was a little something on it. The guitar sounds amazing through my PA system, although it can feed back if not careful. The guitar has an excellent tuner on the top of the body of the guitar and it is very easy to use. I would recommend this guitar if you are interested in Ovations for what I thought was a good price on the guitar. I originally was going to buy a new Ovation from Custom Guitar's Friend, but it was on back order and would not come in until March, so I took the chance and bought the one Ovation, same model that was used, and am glad I took the chance in buying it. It is an absolute beautiful guitar. 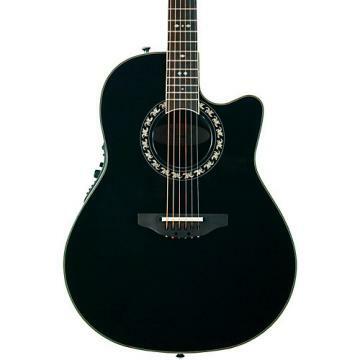 I bought the black colored Ovation, and the quality of the guitar I feel is excellent. .Bought My 1717 Legend in 1988, was searching for a replacement for about a year. tried every make and price range. But just did not find the comfort and clear sweet sounds my 1717 produced. Note to reader we are talking about almost 30 year old guitar. Ovation always known for their superior electronics that have always produced the sweetest notes &tones but unfortunately could not find a new 2016 legend anywhere in stock to play before purchase.Heard same old story from every music shop you know Ovations are now made in korea dont expect the same quality.After a year of searching for a replacement to play on stage and a 3 month backorder wait my new triple A spruce top Black Legend arrived. After careful inspection & tuning plugged in to my Beringer ACX accoustic amp and was Blown Away. Ovation didnt miss a beat every bit the quality and sound I hoped for. Well worth the wait.Now considering ordering one in cherry as a spare. Had a friend once say make a good boat paddle because of body material Ha HA!!! I will put ovations up against any make or model for sound quality plugged in or not just be open to a nontraditional wood body guitar and give a Legend a try. You wont be sorry! Plus that thin C shaped neck feels and plays with the ease of a solid body electric. Besides Glenn Campbell played Ovations on stage most of his life. I trust Glenns choice and im glad i did. .I have played many acoustic guitars since picking up the guitar over 55 years ago. This guitar has surprised me in so many ways. The on-board tuner and pickup system are outstanding features. The tone of this deep contour instrument is probably the best sounding acoustic electric guitar I have ever heard. This is my second Ovation as I bought my first in 1974 (and loved it). The Legend is quickly becoming my favorite guitar. .I've had this guitar for a couple of years now. I have owned a number of good guitars but the ELR plug in makes this guitar stand head and shoulders above the rest! If anyone has never owned one you may be puzzled to find out when you plug in XLR that it doesn't work. They should explain this to the customer. I had to find out the hard way. When you plug in the ELR you also have to have a blank non stereo 1/4" to put into the 1/4" outlet to complete the circuit. I went to my local music store and got a used non stereo 1/4" plug in and drilled a small hole in the end where the cord would normally connect into and took a piece of electrical wire and put it through the hole and twisted it so it would hold the "blank 1/4" jack", then for good measure I then soldered the wire so it can't unwind. Then I wired the blank onto my XLR cord near the end that plugs into the guitar and gave it around 6" wire so it stays hooked onto the XLR end so when I plug in the XLR, the 1/4" is right there and I plug into the 1/4" plug in. This way the two connections are together and I won't put the blank somewhere and forget where it is! This is a great guitar and you can't beat the XLR plug in! I have also gone to this plug in for my fiddle. I use the cord with the 1/4" plug in for my fiddle and the XLR plug in on the other end for the amp. Sure is better than the 1/4" one.I have been playing music for over 60 years now and I highly recommend this guitar and this plug in system.